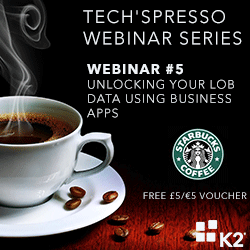 If you are currently customising forms for SharePoint lists, building a user-interface for business process applications, presenting line of business data from multiple back-end systems or looking to move into the mobile forms space then it is highly recommended that you join us for a live webinar on 8 September 2015. This webinar will help you find out how your organisation can deliver rich, interactive electronic forms that meet the needs of today's business application demands. • Deliver forms integrated with SharePoint or that run as standalone applications, or both. This interactive session covers forms in its entirety – focusing on the above-mentioned key points, as well as: applying themes to your forms; what to look for in having mobile forms; and new features to use on your mobile apps. *Countries outside of UK will be issued a prepaid giftcard with the total value applied for attendance at the end of the series due to restrictions on the use of Starbucks eGift cards.